I’ve been having a lot of fun making usual things for my daughter’s American Girl Doll lately. I did the Candy Corn Dress, which was very popular and now I’ve done an American Girl Elf on the Shelf outfit. Isn’t this a hoot? We call it Ellfie on the Shelf, since her doll is Ellie. 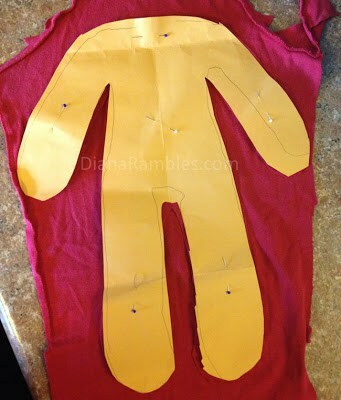 I started out by laying our doll out on some paper and traced around her to create the pattern. Then I laid the pattern out on some red knit fabric. I used the arms of an old shirt of mine. I cut out both pieces, sewed them together, and then cut open a slit along the back to squeeze the doll in. I made a simple hat to match and my daughter added a bell to the tip of the hat. The collar is made from white felt. 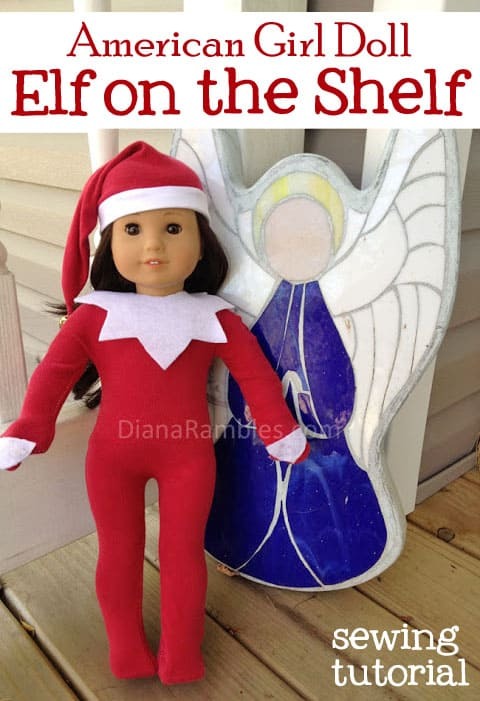 I know that Ellfie is busy planning and scheming for the upcoming Christmas season, even though she *thinks* she’s an angel! What a super cute idea! I know those dolls really become part of the family and this design - and the candy corn dress - include them in all the festivities! That was my favorite part! Haha!! I want to set a good example for dolls everywhere! Too cute! I'm sure she was thankful you covered up all her girly bits! Ummm... I love your censoring! What a lucky girl to have handmade clothes for her American Girls! Thanks for linking up to Tasteful Tuesdays. Adorable! Funny censoring! My kids are going to love this! Thanks so much for sharing!! 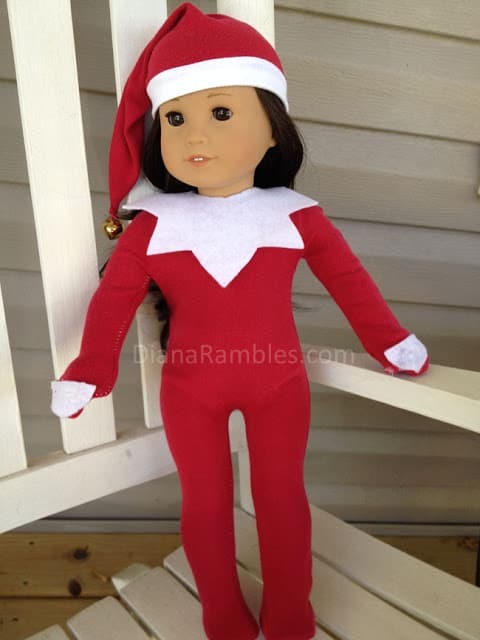 Oh my gosh, how cute and what an adorable spin on the regular elf. I bet girls would love this way more than the boy elf. Thanks so much for sharing and for linking up to Thrifty Thursday. she looks awfully cute! I'm getting itchy for Christmas, too, just like your little elf there. Oh Diana, how fantastic! My daughter is wanting an Australian Girl for Christmas (not quite as popular as the American Girl) and this would be fabulous. I'm not really into the Elf on the Shelf but I love this. Thanks so much for linking up to Thriving on Thursdays. I'm featuring this at tomorrow's party. Thanks for coming! Thanks for sharing at Throwback Thursday. Your doll outfits are too cute! So cute :) I am going to have to get my own doll! Thanks for linking up to Snickerdoodle Sunday! That reminds me of my childhood, when my mom did Christmas costumes for my dolls!! So much cuter than the real Elf on the Shelf! Pinned. This is so cute! My daughter has a doll that definitely needs this outfit for Christmas.